Studio Ghibli proposes a challenge for themselves with their latest animated film From Up on Poppy Hill. The studio, which is known for its wild fantastical imagination displayed in such films as My Neighbour Totoro and The Secret World of Arrietty, decides to ditch the creatures and the animals. From Up on Poppy Hill is a coming of age story featuring a young romance that blossoms only for the two lovebirds to find out that there is more to their relationship. It’s a bold move on Ghibli’s part and a daring choice for Hayao Miyazaki – who co-wrote the script – and his son Gorō Miyazaki – who serves as the director – but From Up on Poppy Hill is a dud. It pains me to write that Studio Ghibli misfired, but it’s an unfortunate truth. Let’s look past the vivid dreamlike scenarios the animated team has conjured up with prior films. What ultimately drove those features was its ability to charm audiences with an innocent story. The characters are usually these wide-eyed dreamers who find real life is easier to handle when something unfamiliar and magical yet tangible is added to the equation. You can teach this same writing technique in a story without imaginative creatures. The budding romance between Umi (voiced by Sarah Bolger) and Shun (voiced by Anton Yelchin) is that likeable difference. Umi and Shun are two teenagers who are opposites, but find an attraction in one another. The relationship between Umi and Shun is intriguing at first. The two play hard-to-get with each other and eventually start to give in – in a playful way. It’s convincing even if it’s in a cartoon form and is down played for the most part. Then, the climactic moment; when Umi and Shun uncover a detail that drastically changes what they think of their relationship, it should have moviegoers gasping as well. However, this turn of events feels like too much of a contrivance. It asks audiences to bend their suspension of disbelief – which Studio Ghibli has done in the past – to a degree that makes imagining fantastical beings like Totoro and Arrietty seem like a cakewalk compared to what Miyazaki is attempting to pitch to moviegoers. While adults will look at the screen in confusion, kids will be instantly tuned out from the word “go”. Like adults, kids don’t need fantastical creatures to keep their attention steady – just a good story – but, From Up on Poppy Hill is too talky and slow paced to keep a child interested. Studio Ghibli’s traditional animation is always respected, but when we’ve seen their talents utilized so well in the past with large, extravagant ordeals, it makes their work in From Up on Poppy Hill seem under-appreciated. It’s a type of story that doesn’t necessarily call for an animated treatment. It’s strange that the team decided this one was worth telling. Miyazaki wants to make us laugh with that usual comic relief the studio provides. I hate to compare films again, but it’s hard not to when the jokes have been kept at an appropriate minimum in the past and here, they’re thrown in our faces constantly and loudly. Shun belongs to a clubhouse where many boys run clubs and socialize. The boys are all represented as spastic, hot-headed, or both. Ron Howard, along with other voice talents, say their lines with such an abundance of excitement, that key deliveries are lost because moviegoers will be trying to fathom why everyone feels the need to yell. The girls and the boys are brought together to save the clubhouse from destruction by a wrecking ball to make way for the 1964 Tokyo Olympics. I suppose the few children who are trying to stay awake while watching From Up on Poppy Hill will take away a message of the importance of teamwork from the clubhouse story, but the highlights are far and few between. 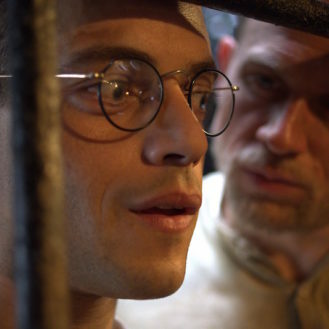 Without spoiling too much, I appreciate the film having a fairly open-ended conclusion. It shows that Studio Ghibli trusts their audience. 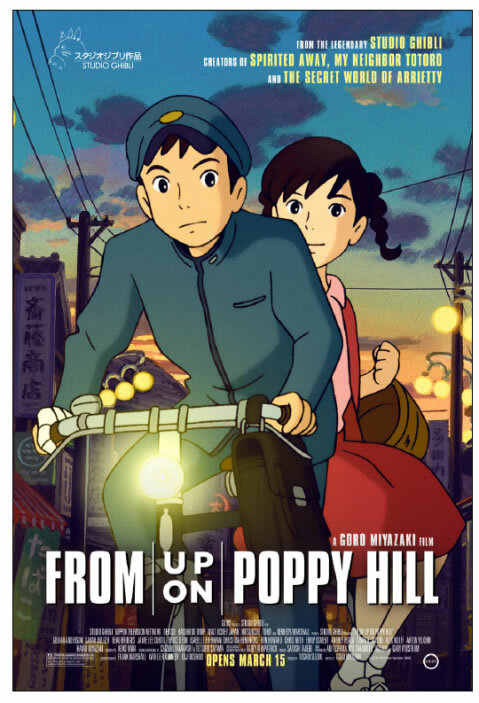 Other than that, From Up on Poppy Hill acts as a rather dull smudge on their track record. I saw From Up on Poppy Hill at the TIFF Bell Lightbox in Toronto, Ontario. To my understanding, they’ll be showing both a dubbed version of the film (which I saw) and a subtitled version. Maybe by watching the subtitled version, moviegoers will be able to get something out of From Upon Poppy Hill by removing something completely.